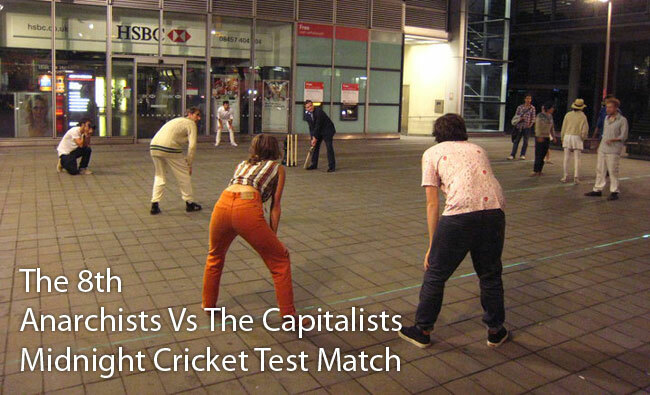 Midnight Cricket is a game where the Space Hijackers venture into the city, to host Anarchist Vs Capitalist cricket matches on the streets of the financial centre of London. After finding a suitable pub, full of bankers and hedge fund managers, we arrive en mass dressed in our cricket whites and drink with the suits, striking up conversation and then challenging them to a match at closing time. The games force two opposing cultures to speak and argue out their stance. We also aim to transform the space we play in, in the mind of the participants, and ask the capitalists to start questioning authority and use of space when the police, undoubtedly turn up. Previous matches have taken place by Lloyds of London, opposite the Bank of England, by St Pauls Cathedral , in the Broadgate Centre and on Spitalfields Market. This time we set our sights squarely in the square mile and chose a likely pitch in front of Fenchurch Street Station. The night began in disaster. We arrived at our chosen pub to find it almost empty and quickly discovered that it closed at an appalingly early 9.30pm. Bicycle outriders were sent for, the area surveyed and closing time found us in a wetherspoons pub with city boys few on the ground. Undauted, we announced our match over the PA and went out to the pitch with the few that we could gather up. Once we set up the match up, with our 20-something strong anarchist team infiltrating the capitalists when they couldn't make up the numbers we had a steady stream of commuters rushing to make the last train from the station. It was easy to pursuade a few of them to stay for a ball or two, missing trains and having to run for cabs. Often when one city boy took the bat their friends would quickly rush to bowl. Capitalist Vs Capitalist crickets, sowing dissent in the ranks! Obviously since the capitalist side kept changing as they came and went to the trains we had to win, we were the only team. Eventually losing must have become too much for them (or maybe it was the station closing) because our opposition began to dry up. We moved to a new pitch around the corner in the allyways for a little training. Then we moved on to our old favourite ground at Spitalfields Market. A few more rounds played, a little urban architecture subverted and then things get a little hazy. But we're pretty sure we won. Dont ask what happened to the losers.